Charles Hard Townes addresses a luncheon audience after receiving his LIA Lifetime Achievement Award at ICALEO 2010 in Anaheim, Calif. 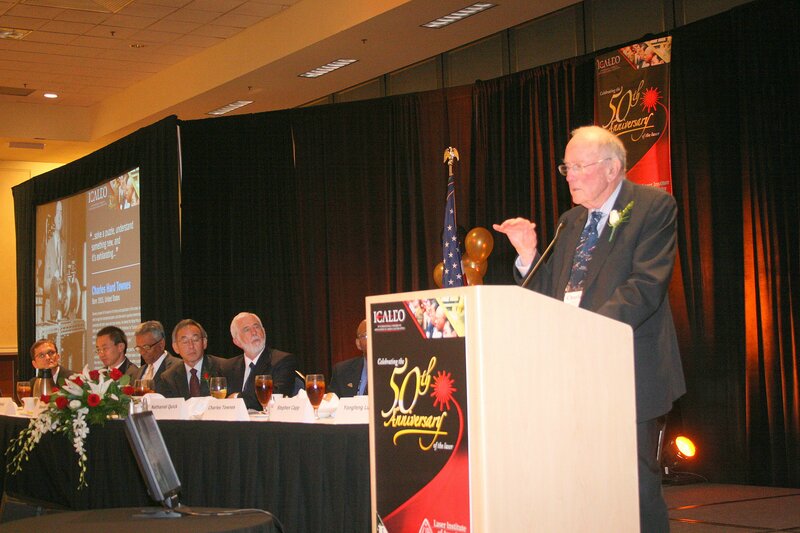 When Charles Hard Townes stepped up to the podium at ICALEO® in September 2010, he was a 95-year-old legend speaking to hundreds of disciples whose life’s work stemmed from his creations. It was his own life’s work that brought him to Anaheim that year to accept LIA’s first Lifetime Achievement Award. Townes, professor emeritus of physics at the University of California, Berkeley (read their appreciation here), persevered to the point where he still made daily visits to the campus up until about a year before his death Tuesday in Oakland. The man who created the maser and conceived the laser discussed his thoughts on receiving his LIA honor in a May 2010 email from his Berkeley account. As his New York Times obituary notes, Townes and his brother-in-law, Arthur L. Schawlow, secured a patent for their “optical maser” through Bell Laboratories in 1959 — a year before Theodore Maiman built the first operational laser. He often told the tale of the revelation — occurring as he sat on a park bench in Washington, D.C. — that led to his ground-breaking invention. In an interview during the celebration of the 50th anniversary of the laser, he recalled wondering why he hadn’t been able to come up with an idea for how to produce short waves while doing spectroscopy in the microwave region with electronic oscillators. Before the last meeting of a national committee he was heading up to study the problem, “I pulled out an envelope from my pocket and wrote down the equation” that proved to be the answer. Instead of unveiling what he called “kind of a funny idea” at the meeting, he waited until he got home and fleshed out the roadmap for what became the maser (microwave amplification by stimulated emission of radiation). For his efforts, LIA “decided to present the special award to professor Townes to recognize his contribution to the development of the first laser 50 years ago and in recognition of his lifetime body of work,” said LIA Executive Director Peter Baker. It was “a huge privilege” to listen to Townes’ presentation, which he remembered included the pioneer’s story of how two Nobel-winning professors senior to him tried to dissuade him from continuing his early research. While we mourn the passing of this giant and his legacy, we fondly recall his passion and vigor and thank him for the work that continues to guide our mission. Did you study with or meet Dr. Townes or listen to a presentation of his? Feel free to share your thoughts in the comments below or email them to Geoff Giordano at ggiordano@lia.org.